GPS III SV02, the second Lockheed Martin built GPS III satellite, has arrived at Cape Canaveral, Florida in readiness for a planned July 2019 launch. GPS III is an entirely new design that brings higher power signals that are more accurate and hardened against jamming. The first of the new generation launched on 23 December last year and is currently in the check-out phase if in-orbit testing ahead of going into service. Designed and built at Lockheed Martin’s Processing Facility near Denver, Colorado, GPS III SV02 has been nicknamed "Magellan" after the Portuguese explorer Ferdinand Magellan. SV02 is the second of ten satellites in production at. 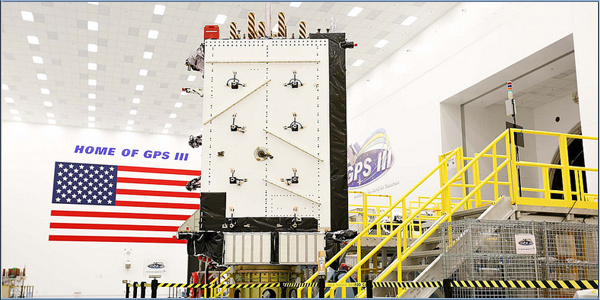 Lockheed Martin were also selected under the GPS III Follow On (GPS IIIF) program to build up to 22 additional GPS IIIF satellites worth $7.2bn.